BOSTON -- From the moment Mitt Romney stepped off stage Tuesday night, having just delivered a brief concession speech he wrote only that evening, the massive infrastructure surrounding his campaign quickly began to disassemble itself. Aides taking cabs home late that night got rude awakenings when they found the credit cards linked to the campaign no longer worked. 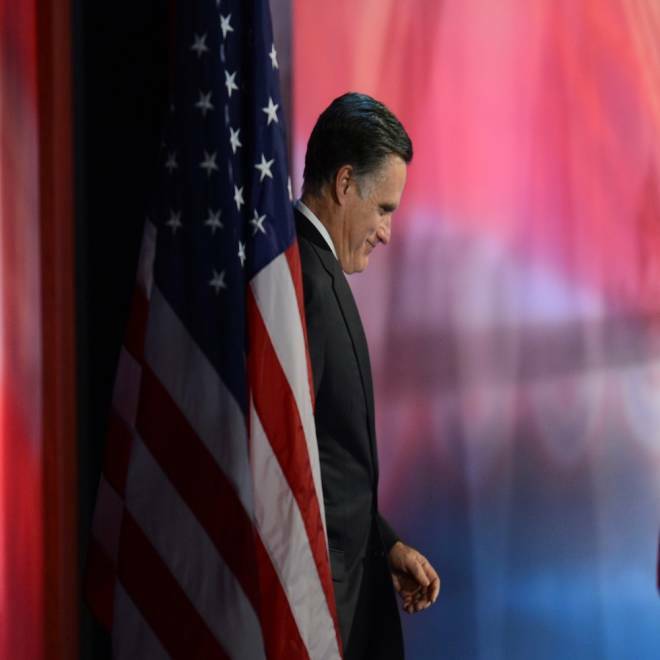 Republican presidential candidate Mitt Romney arrives on stage to concede the election to President Barack Obama on November 7, 2012 in Boston. "Fiscally conservative," sighed one aide the next day. In conversations on Wednesday, aides were generally wistful, not angry, at how the campaign ended. Most, like their boss, truly believed the campaign's now almost comically inaccurate models, and that a victory was well within their grasp. Yesterday afternoon, campaign manager Matt Rhoades thanked the staff in one last meeting at the campaign's Boston HQ, as did Romney and his wife, Ann. Ann Romney's remarks brought several staffers to tears as she told the assembled group that they would always be part of the fabric of the Romney family. After their speeches, Tagg Romney drove the former candidate and his wife home to Belmont. The office at 585 Commercial St. was largely packed up by the close of business Wednesday (one aide said it looked like it had been sacked by Visigoths), but some staffers will return today to remove their things. The Mitt Romney for President financial entity survives for as long as two more years, as bills are paid and FEC documents are filed. Thousands of hours of campaign and family videos stored on a server will soon find a home for safekeeping for the family. Many Romney aides borrowed from the Capitol Hill staffs of other top Republicans, like John Boehner and Paul Ryan, return to work this week. Most everyone else takes a break and starts looking for work again -- with vacations planned in the mountains of Colorado, rounds of golf booked in Florida and rental vans on hold to move lives back to D.C. and other parts unknown. By Wednesday evening, campaign staffers noticed a dramatic drop off in email traffic, as the campaign's prolific "war room" email system, which blast out reporters stories and tweets of note to the campaign, fell silent. It's dry season for campaign operatives though, and a few aides said they expect it to be January before they're re-employed. Some said they would be quitting politics, at least for now. In the meantime, lots of Marriott points will be cashed in.